Hate it when you run your fingers through your hair and find them all stuck in knots and tangles? SheaMoisture's Coconut & Hibiscus Curl & Style Milk with Certified Organic Shea Butter will transition dry, damaged, over-processed hair to frizz free, detangled naturally beautiful curls! 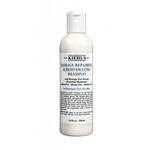 This styling milk is boosted with natural ingredients needed to condition your curls and restore shine. SheaMoisture's Coconut & Hibiscus Curl & Style Milk contains Coconut Oil to hydrate and protect your hair against damage and reduce breakage. 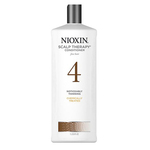 Silk Protein and Neem Oil will smooth messy, wavy, curls and give your hair a soft and silky feel. 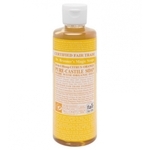 This natural styling aid is designed to give your thick curls definition. SheaMoisture's Coconut & Hibiscus Curl & Style Milk is a leave-in moisturizer and hair treatment product that gives you soft, shiny, natural, bouncy, frizz-free curls that will tempt you to flaunt your hair every chance you get! 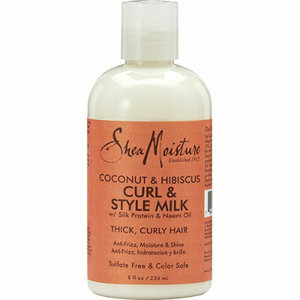 You can use this Curl & Style Milk from SheaMoisture every day for enviously lustrous and easily manageable curls. 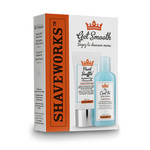 Apply as a non-rinse moisturizer and styling cream to damp, towel-dried hair as needed. Deionized Water, Butyrospermum Parkii (Shea Butter), Cocos Nucifera (Coconut) Oil, Sugar Starch, Silk Protein, Essential Oil Blend, Melia Azadirachta (Neem) Seed Oil, Caprylyl Glycol, Sorbitol Esters, Algae Extract, Hyssopus Officinalis Extract, Salvia Officinalis, (Sage) Leaf and Equistum Arvense Extract, Daucus Carota Sativa (Carrot) Seed Oil, Lonicera Caprifolium (Honeysuckle) Flower (and) Tocopherol (Vitamin E) Hibiscus Flower Extract.